After decades spent in the audio industry, hearing every imaginable system configuration and seeing countless High-End equipment designs, Igor Tjurin backed by his Audes team embarked on a journey to create something different. 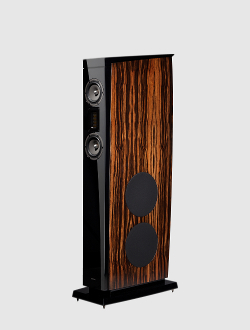 Something distant from ‘superspeakers’ with often uncomprehending looks and dimensions, yet which delivers the highest levels of sound quality. This is how the Excellence AMT series was born. Design of Excellence AMT is a union of classic luxury and modern austerity. The slim body in a true black piano polish finish is complimented with rounded inlaid Makassar ebony panels giving a noble and majestic look. Ex facte minimalism vanishes amid abundance of complex surfaces and bent contours blending into a graceful and elegant body, ultimately resulting into a true piece of art. The sound of the series is based around a carefully chosen AMT tweeter. This fact is reflected in the name of the line. The tweeter is partnered with SEAS Excel mid-woofers and Audes woofers. 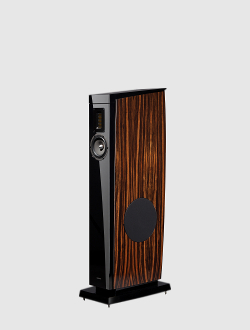 This configuration delivers the clarity and the accuracy of sound reproduction across all frequencies, being able to process even the shortest impulses precisely, while retaining a complete neutrality of the entire tonal range.